With concerns growing about the future of Britain’s bumblebees, a unique interactive Pollination Conference for all ages will be held in Chesterfield, Derbyshire on Thursday 30 April – exploring the beauty and importance of bees and pollinators, and launching a major Pollinating the Peak campaign by Bumblebee Conservation Trust. The Chesterfield Pollination Conference – at the Winding Wheel Theatre, Holywell Street from 9am to 5pm – will allow people to learn more about pollination and how to help bees, including by managing gardens or land in a pollinator-friendly way. The event will feature two distinct elements – a conference and an exhibition. Places are free for both, but are limited and need to be booked in advance. Key speakers and guests include former Chief Executive of Peak District National Park Authority Jim Dixon; pollination scientist from Dublin’s Trinity College Erin Jo Tiedeken; writer and leading entomologist Tim Gardiner; and experts from Bumblebee Conservation Trust and other organisations. In the exhibition area there will be fun interactive workshops, films and children’s activities, story-telling, beekeeping and cookery demonstrations, bees at work in a fascinating ‘bumblearium’, microscopic views in a unique Polli:lab, refreshments and lunch. It is open to all, including landowners, farmers and general public. Schools are invited to send up to 10 pupils of all ages together with up to three adults. 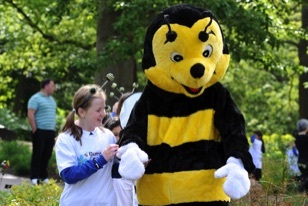 The event is being organised by Bumblebee Conservation Trust with Chatsworth, Communications & Campaigns International, Moors for the Future Partnership, water saving experts HSG UK, Plain Green and Little Green Space. Chesterfield Borough Council is hosting the conference as part of its commitment to biodiversity and landscape conservation in Derbyshire. To book a place, visit www.bumblebeeconservation.org/get-involved/events-calendar or call Gill Perkins on 07825 639195. The all-day exhibition can be visited without booking. Bumblebees pollinate fruit and vegetables, and one in three mouthfuls of our food are due to the hard work of bees – but their populations have crashed due to climate change, pathogens, toxicity of pesticides, habitat loss and other pressures. Some species are already extinct and others are now threatened. Bumblebee Conservation Trust is dedicated to securing the future of the UK’s bumblebees. The charity’s three-year Pollinating the Peak campaign will provide local people and communities with opportunities to take positive action – such as by creating bee-friendly habitats and by taking part in BeeWalk, a national recording scheme monitoring bumblebees and providing early warning of declines.